It’s that time of the year again…the 90 plus days that are the bane of existence for most adults with ADHD. 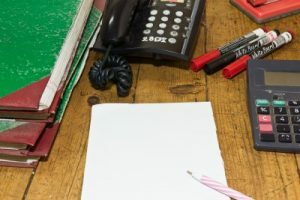 Yes, I’m talking about tax season – when all of our best intentions from the year before can either feel like our saving grace or plunge us into weeks of despair. For whatever reason, taxes seem to combine all of the struggles of ADHD into one fell swoop. Last year, I shared the common experience of “a week with adult ADHD” to show how even the best of intentions can lead to chaos, putting out fires, procrastination and barely making deadlines. This year, in the midst of tax season, my thoughts turn to the ADHD challenges that make meeting deadlines so difficult to meet. Meet ‘Amy’, she is a single mother running her own business and a recently diagnosed ‘ADHD adult.’ Each year, she vows she is going to file her taxes by the end of February allowing her to use the refund to finance some updates on her house and maybe even plan a trip for April vacation. Determined to do it “right” this year, she sets aside a day on the calendar to “do her taxes”…and then the overwhelm hits. Paperwork. Where are all her receipts, W2 forms, 1099s, credit card and bank statements? Her first stop is the basket in the laundry room she purposely set there so she could immediately file any incoming mail that has to do with her finances. Success! There are two 1099 forms awaiting her. She is also thrilled to find the letter from the bank with her mortgage interest and real estate tax information, but realizes she doesn’t remember if she received another one over the summer from when she refinanced. She makes a mental note to look for this. Once in the laundry room, she realizes that she has once again left a load of laundry in the wash too long, restarts it and folds the pile of laundry on top of the drier, puts some of her son’s clothes into soak and makes a mental note (for the second time) to herself that she needs to buy detergent. While folding the laundry Amy looks out the window and realizes it’s past Presidents’ Day and the rose bushes still aren’t pruned. Impulsively, she grabs the clippers and her gardening gloves and heads out to the backyard. Once back inside and about four hours into the day of “doing her taxes”, she happens upon a W2 form from her part time job, not in the basket, but on top of the microwave. Vaguely she remembers putting it there after her son knocked over a cup of fruit punch trying to make some popcorn. Exhausted Amy decides to start “doing her taxes” tomorrow. As “doing her taxes,” continues (aka the next day), Amy starts in to collect details on medical appointments and co pays to see if she can claim any deductions. Some of these she remembered are listed in her checkbook. Searching other piles of paper throughout the house, she finds the invoice for her daughter’s retainer ‘filed’ in with old school notices, and the receipt for her contacts is in the medicine cabinet next to the empty box of replaceable contacts. Amy gets distracted by the disorganization and spends the next hour of “doing her taxes”, cleaning out the rest of the medicine cabinet and tossing out expired medications, perfume and lotions. Once done in the bathroom, Amy’s focus returns to taxes. She remembers that she tucked away a recent letter about her retirement plan form in a ‘safe place.’ Problem is, she can’t remember where that safe place is…maybe in a folder from when she refinanced? But where’s the folder? In the laundry room? An hour later, Amy finishes folding the laundry and starting another load, but forgot why she went there in the first place. Wasn’t she “doing her taxes” today? Refocused the search continues. Amy finds receipts from lunch meetings in her wallet and a few more stuffed in the glove box of her car. During the search she also came across the notebook she had bought to keep track of her mileage to those meetings (the notebook has only two entries from that first week in January). Amy makes a mental note to start tracking her mileage for this year. Feeling somewhat exhausted, Amy’s relieved that she purchased an easy online bookkeeping system two years ago for her business to keep track of invoices and payments (an ADHD strategy she learned from a colleague with ADHD). However…well into the evening of day two of “doing her taxes”, she realizes she hasn’t kept up with using the system and the search begins for records of the past year’s expenses. She finds some expenses on her credit card bills and others listed in her checkbook. After a thorough inbox search under “taxes,” Amy finally finds the remainder of the expenses in an email folder under “important”. It’s no wonder why getting your taxes done is such a challenge. But, getting them done is not an impossibility. It just takes some extra work. The first step to figuring out how to get organized is to figure out where you are disorganized. When you figure out how things aren’t working right now, you can put in place strategies that bring on success. This year, when you start to pull together your receipts for tax preparation, try to locate papers to refinance, or pull together necessary items, take stock of where things are located. Is the issue that you have no one place to put everything, or maybe it’s the wrong place? Get feedback from friends, family, or coworkers who can take a nonjudgmental, nonpartisan view of your organizational style. Often someone else has insight on your behavior that you might not have. You know you have difficulties planning, staying focused or other symptoms of ADHD, but often you may not see how your behavior reflects it. Others may see how certain things distract you while sorting the day’s mail, or know you focus better first thing in the morning. Determine how your unique ADHD brain categorizes information and cater to that strength. Are you a visual person who works well with colors? If so, get bright baskets or folders with labels so you automatically know exactly where to file papers without having to think through the process. Do you work better with written triggers? When you are in line to buy something, send yourself a text reminder to add the expense (or log in to the system and do it right there). Or do verbal reminders work best? Use a recording system on your phone to tell your future self where items have been placed. Do you have unique tips or strategies that you do at tax time to help keep you on task? I would love it if you would share them in the comments below and perhaps someone can learn from those tips also. My ADHD partner (independent contractor) employs a bookkeeper who catches up once a month for an hour to download bank transactions into QuickBooks, and sort out which are deductables etc. Not charging much, it keeps it manageable. At tax time, it’s a 2-3 hr appointment to pull together any other items and fill out the return. Having social interaction, and a deadline knowing the bookkeeper is coming on a fixed day when she’s going to expect the receipts etc helps her pull most of the required material together. She doesn’t consistently get all the parking receipts into her return, but she gets more of her returns done this way than I have over past years. So…her bookkeeper is spending a whole day with me soon to do my return …. first return in years, and the start of a process to catch up back returns. « Do You Have an ADHD Success Diary?